I would like to introduce you to my friend Polly & her pals. We spend a lot of time together each day. But I must admit that I don’t know the friends names..are they all Polly? I am so envious of their collection of shoes. They have such style! I think that Polly is the greatest & the worst invention ever. 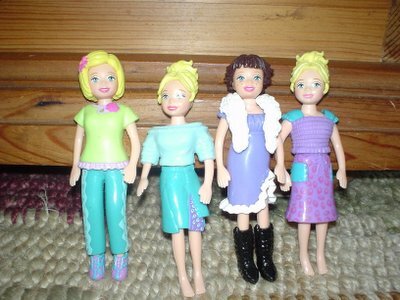 BigZabba loves them, but she also asks many times each day…..
“Mommy, would you like to play Polly Pockets with me?” There is only so much of Polly I can take in one day.